LOS ANGELES, CA – With the winter anime season already in full swing, countless fans find themselves watching yet another host of new anime. Inevitably, many struggle to keep up with the multitude of new shows airing every week, and often end up with a backlog spanning several seasons over time. Stephen Sherman was one of these people — until he discovered his own revolutionary way to watch anime. By adjusting the playback speed on his video player, Sherman effectively reduces the amount of time he must spend each week watching seasonal anime, playing all videos at 1.5x speed or higher. Sherman discovered this technique during his search for a way to watch all of his desired anime without quitting his job. Sherman first employed this strategy at the start of the Fall 2017 season, and to great success. 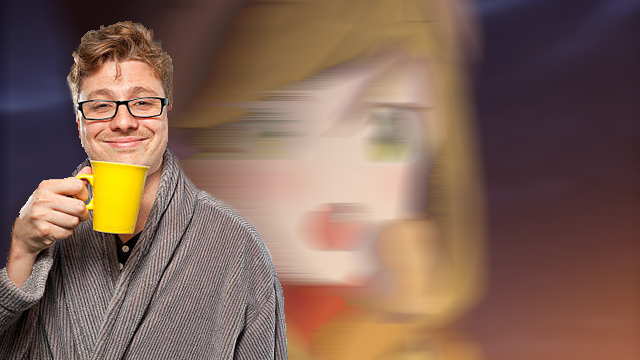 He has since cleared out his backlog of seasonal anime dating back to 2016, and having developed superior reading speed, is now able to complete light novels at a much faster pace. Sherman claims he can even read the entirety of the flashing text cuts found in the Monogatari series without pausing the video. Sherman’s newfound talent has more practical uses as well. He claims to have received a promotion at work for his sudden increase in productivity and has outgrown his hatred for nightcore anime remixes on YouTube. But not all anime fans agree that Sherman’s revolutionary new anime watching method is fair. Other fans offered alternative methods to watching anime in a reasonable time — including watching multiple episodes simultaneously or just not watching anime and reading episode synopses. Regardless of these naysayers, Sherman is sure he will continue using this revolutionary technique, as it has proven to be best for both himself and his family. Vextrr has circumnavigated the globe on several occasions, and has trekked across the most barren of deserts, scaled the most daunting of mountains, sailed the most unforgiving of seas, traversed the darkest of depths of the internet, and has confirmed that his waifu, in fact, does not exist. Likely destined to still remain in denial for the rest of his life, he now spends his days watching anime and writing for Anime Maru. Pfft only 2x speed. Real pros go at least 4x. Everyone knows that 3.9x speed is the way to speedwatch. Not only is it fast, but it even makes Berserk’s animation mostly smooth. Real anime fans watch everything at half speed to fully appreciate it. I actually preffer to watch illegally because the OpenLoad player can play videos in 1.12x speed. It doesnt sound speed up but I still save time! true elitists on a time restraint watch 4 episodes at the same time. I have done so. and don’t remember what happened. Otherwise we watch it at 4.20x the normal speed, like teekyuu.